CHANDRA THOMPSON is a person who leans forward as opposed to looking back. She puts her heart and soul into everything that she does and when faced with a challenge, Chandra takes the basket of lemons and makes lemonade. Case in point, when Chandra was laid off from her corporate marketing job earlier this year, she didn’t fret or worry, she took it as a sign that it was time to finally step forward and launch her own company. 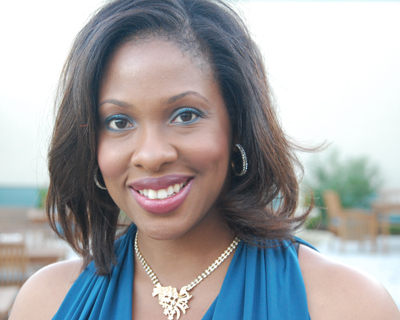 As an artist and interior designer, Chandra works with clients to create colorful and vibrant interiors by utilizing color blocking, stenciling, and decorative wall design techniques. Chandra’s firm, Liv Luv Design was born out of Chandra’s passion for interior design and her family’s habit of sending her clients after they were impressed with the design projects that Chandra completed in her own home. One of the joys of editing Zavvi Rodaine is having the opportunity to meet so many diverse and inspiring women and Chandra is no exception. Our scheduled 15-minute chat turned into a hour-long laugh fest. Chandra is authentic and a real go-getter as I’m sure you will discover after reading her interview. With a successful career in corporate marketing, what made you finally decide to follow your passion and start Liv Luv Design? I had been tossing the idea about for several years now, not willing to take the plunge because of all the risks involved in starting a new business and giving up a lifestyle that I had become accustomed too. At the same time I had grown dissatisfied with my job and lack of work-life balance, so when I was laid off earlier this year with a baby on the way, it seemed like the right time to venture out and start something I could call my own. The Liv Luv Design blog was a way for me to share with the world my design vision and to connect with others who share a passion for design. With this new entrepreneurial adventure, how do you create balance in your life? It’s not easy, that’s for sure. I find time early in the morning right after I drop the kids off at school, during my lunch break from my part-time job, and at night after I put them in bed. I’m a night owl, so it’s not unusual for me to be pecking away at the computer until 2am in the morning, knowing I have to be up at 6am. I can’t do that every night, so I go to bed earlier whenever I can. When did you discover your talent for color blocking, stenciling and decorative wall design? 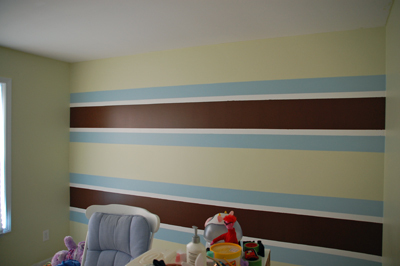 When we moved into this house I was determined not to leave all the walls in “builder beige”, so I painted my daughters’ rooms. 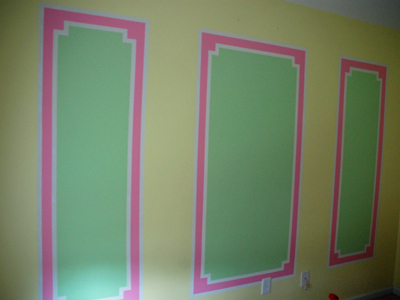 For my oldest daughter’s room, I was inspired by a harlequin design I saw in a paint decor magazine and thought it was a great way to inexpensively add color and pattern. 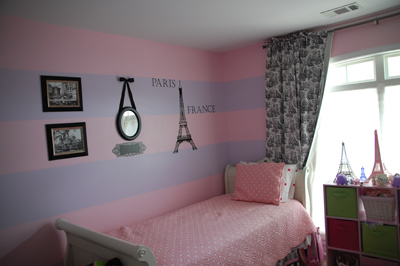 An episode of Divine Design where Candice Olson painted faux white picture moulding against candy pink walls in a little girl’s room inspired the technique I applied in my youngest daughter’s room. I found myself getting lost in the work, not even taking breaks to eat and that’s when I knew that I had a passion for design. Even though I liked how the rooms turned out, I really didn’t believe it was any good until my friends and family wanted to show the rooms to people they barely knew. I later went on to stencil the powder room with an embossed peacock feather design. I call it my escape to Morocco. What inspires you when creating original designs for the projects you are working on? My inspiration for design comes from so many places. The restaurants I dine in, the places I visit, a cute stationery set. I’m also inspired by today’s fashions and look for ways to incorporate the latest trends in my design plans. I love graphic patterns and textures. If it’s easy enough, I’ll copy the pattern and paint it on the wall. My goal is to get clients out of their beige comfort zone and introduce them to the world of color. For my master bedroom, I was inspired by a box of stationery I picked up on clearance at Marshall’s. It had the color scheme and mood I was looking for (lavender, platinum, black, cream and absolutely romantic). It also helps that I hoard design magazines and thumb through them for design ideas to implement in my own home, as well as the homes of my clients. Who are your style & design inspirations? I love the way Jamie Drake uses bold colors in his designs. I like Kelly Wearstler, too. The way Kelly mixes patterns and textures is amazing. I also like Elaine Griffin, the way she effortlessly mixes old and new is something I look to achieve in my own designs. I also must include Candice Olson. Candice has mastered the art of combining form and function in a space to meet the needs of her clients. Casual, eclectic, and elegant. I love using lots of color and mixing different styles, patterns, and textures, but I don’t like rooms being too fussy. I like clean, tailored lines with a hint of dressmaker details and a touch of sparkle. My home is my sanctuary, so I believe every room should be comfortable, livable and definitely, kid friendly. Describe a favorite fashion moment as a child. It has to be when I was either in the fourth or fifth grade and my mother let me put an ensemble together. It was a pair of white pants with multi-colored neon script writing that I think said, “Mon Cheri”, a hot pink shirt, an over-sized white pleather belt, and some ballet flats. You couldn’t tell me nothing! It was also the moment that I realized that I liked lots of color in my wardrobe and I’ve been wearing color ever since. Paris, France. The City of Lights. Chandra, describe your idea of perfect happiness. Some people think they’ll find happiness when….when they get a new job, a new man, make more money, but I believe that you can find happiness now in your every day moments. My happiness comes from creating beautiful things and spending quality time with my family. No phones, no TV, no homework, no tennis practice, just the whole family laughing, playing and enjoying each other. Name a song that takes you some place special whenever you hear it. ‘Spend My Life With You’ by Eric Benet and Tamia. It was the song my husband and I danced to at our wedding. It takes me back to the beginning of our journey together and it reminds me how much I have enjoyed every part of it. I support the United Way because the fund helps so many other organizations in the community and Breast Cancer research because so many women, especially Black women, are dying needlessly from the disease. Pursue your passions with all of your heart. Don’t let anyone, not even your parents, decide on a path for you because ultimately you are the only one that can live your life and you have to be happy with the decisions that you make. To Be Happy Is To Create. Photos from Chandra’s portfolio and personal collection. I have the pleasure of calling Chandra my friend and I can attest to the fact that she can put together magic with color and texture and very little cost. Stepping out into her own company was answering a call from her soul and that’s why she’s going to be successful!! Wonderful interview! Thanks for putting the spotlight on a fab up & coming designer – I always get inspiration from other designers doing their thing! I’m so impressed!! And happy for you Chandra. Looking forward to being one of your clients! So I’ll be making contact very soon. Can’t be any prouder!! Love Liv Luv. I HAVE KNOWN CHANDRA FOR MANY YEARS, AND SHE HAS ALWAYS BEEN ON THE CUTTING EDGE OF ART, DESIGN, AND FASHION. SHE IS MORE THAN CAPABLE IN BRINGING LIFE INTO YOUR HOME. SHE IS VERSATILE AND WILLING TO THINK “OUTSIDE OF THE BOX”. GREAT INTERVIEW! I knew Chandra growing up through-out our childhood , we were classmates for at least a decade or more, Chandra has always been a great human being inside and out. Business with her ..thats a no brainer.She’s just plain ole’ good folk..and thats who you need to trust in your home.